schemes later on will be misapplied. Families differ as to their dispositions toward rooms. Most of us would not think of calling for an old-fashioned parlor in a small house nowadays, but merely to change the name from "parlor" to "living room "doesn't change our habits. The living room is meant to take the place of parlor, library, reception hall, and sitting room. If the family adjust themselves to it a great saving of space is effected, and the home life is given added enjoyment. Not all of us, however, can fit ourselves to new ideas, and it is better to suit ourselves than to be uncomfortable and feel out of place in the home. 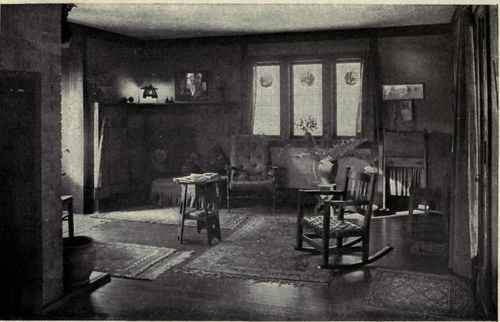 The living-room plan in a small house reduces the reception hall to something little more than a vestibule, but where six rooms are exceeded the reception hall may be enlarged and made serviceable. The first impression counts for much, not only with our guests but with ourselves, and if the hall be appropriately finished and fitted it seems fairly to envelop one with its welcome. One thing that must be insured, whatever form the entrance may take, is that it shall not be necessary to pass through the living room to reach other parts of the house.